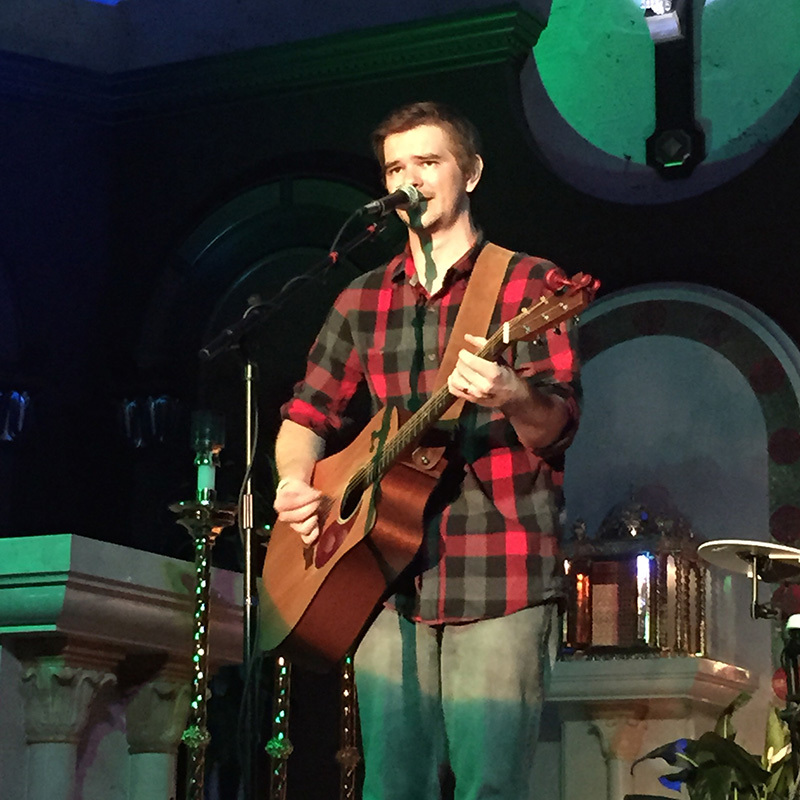 Spotlight on Scott Aitken (from Scott's profile posted here at Top Catholic Songs). Scott Aitken: Producer / SingerSongwriter / Engineer / Former Frontman for Leap of Faith, Sacred Heart Production Studios. From a 3.9 GPA at Full Sail University to a Full-fledged audio recording and production studio, Scott Aitken has run the gamut of the music industry. Whether running the sound board for Rock and Roll Hall of fame legend Dion or making on-stage appearances with world-famous Tony Melendez, Scott’s fluidity in audio-tronics has placed him at the cutting edge of sound engineering and composition. At the age of twelve, Scott’s Brother brought him a guitar, and with just a few strums on the battered instrument, Scott was hooked. At age 16 Scott had landed a recording contract, but at the age of 18 he decided his musical career would be better off in his own hands, due to the limitations of musical creativity that go along with being on a record label. Scott then devoted himself to mastering his craft of both music and engineering. He formed the group Leap of Faith and his song, Can’t Stop, spent several weeks on the airwaves in 2006 with the Clear Channel Radio station 88.1, Way FM. He introduced much of his original music by touring the United States for Alive In You– a ministry dedicated to reaching teens through service work– as well as a variety of venues throughout Florida. The advent of Sacred Heart Production Studios, Scott’s own production company founded in 2005, has enabled him to produce a wide range of talent from classical to contemporary. Whether Ska, Punk, Hip Hop, Rap, Rock or Funk, Scott’s ability to write and produce high quality sound stands out. Dedicated to producing quality music with a real message, Scott’s ability to draw out the best in artists drives him forward. In fact, a hallmark of Scott’s music career is found in his unwavering conviction that music is not just noises strung together, but the conveyance of real ideas, ideals and emotion to another human being. Since Scott puts so much of his heart into his work, the beauty that he is able to produce fuses the best parts of humanity with the latest that technology has to offer. Scott currently resides in Johnson City, TN with his wife, Laura and daughter Lily. When he is not in the recording studio, he and his wife spend their time enjoying the simple things in life like raising their daughter and spending time with family. His experience in performing live ranges from Sunday Mass service to full blown Rock Concerts around the country. Owner and Founder of Sacred Heart Production Studio/ Sacred Heart Records, (2005-2014). On the Board of Advisers for Smart Cup International, (2011-present). 7 years Youth Minister/ Worship Leader for teens/ Bulletin Editor/ Website Designer/ Technician for St. Patrick Catholic Church in Palm Beach Gardens, FL. Scott has implemented and runs the Middle School Youth Group, High School Youth Group, Young Adult Group and Summer Vacation Bible School. 3 years as Worship Leader for St. Martin De Porres Catholic Church in Jensen Beach, FL. 3 years as Shipping Manager for Diabetes Provider. 7 years of volunteering in the Life Teen music ministry and Youth Ministry at the Cathedral of St. Ignatius in Palm Beach Gardens, FL. 2 years of volunteer work in both Music Ministry and Youth Ministry at Annunciation Catholic Church in Altamonte Springs, FL. 3 Summers of Alive in You Service Camp/ Youth Conference. 3 Summers of Catholic Heart Work Camp in Orlando, FL. Running sound for Rock N Roll Hall of Fame Artist “Dion”, 2012. Opening band for “Bad Company/ Iron Butterfly” at the Pig Gig in Carlin Park, 2003.